In 2017, Big Data as a term is pretty much dead. The market – VCs, Startups and F500 companies – have stopped using Big Data as a term to describe their programs/projects and have moved to Machine Learning (ML) and AI. Everything Big Data is now AI. 2015 was a year of significant change in the “Art of the Possible” with Analytics. Norms about Analytics are evolving, and as they do, leading to wholesale business model transformation and cultural change at some workplaces. This change is driven not only by fast-moving technology, but also by new techniques to get value from data. 2016 is turning into the year of “democratization of data”, AI and Deep Learning. The state of the art is around Deep learning (also known as structured learning, hierarchical learning or machine learning), which are essentially efficient algorithms for unsupervised or semi-supervised feature learning and hierarchical feature extraction. Customer intelligence is the hot space. Commoditization pressures and shifting consumer expectations have inspired many companies to creatively use data and analytics to enrich their core products and services, a phenomenon called “wrapping”. Companies wrap offerings with information to differentiate them and to add value to customers. The best companies build distinctive competencies for wrapping. However, there’s a lot of technology in the world, my friend. 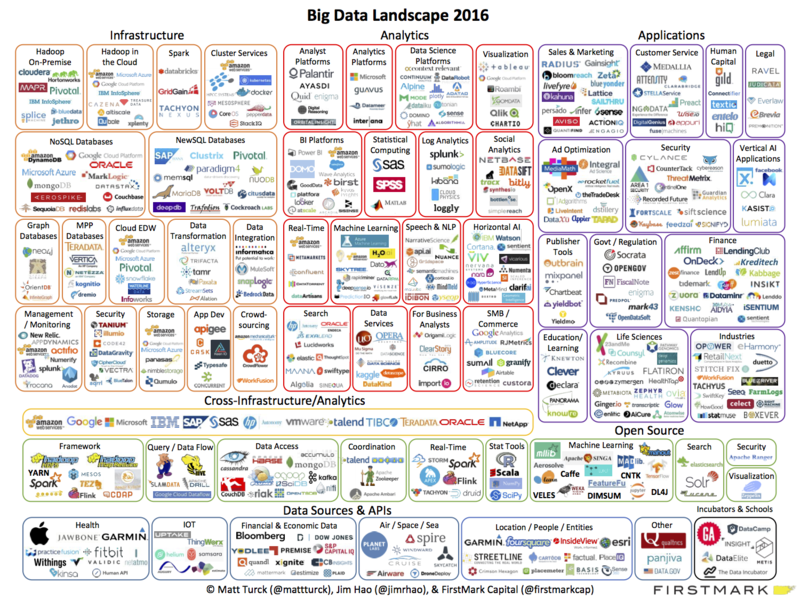 The 2016 edition of Matt Turck & Jim Hao Big Data landscape supergraphic is shown below. A post by Matt Turck, a partner at FirstMark Capital, with a previous version 2014 – Big Data Landscape v. 3.0.